Orange County, CA — A family of Black entrepreneurs has embarked on a mission to inspire children with African history and Black culture. Their project — called “Kids of the Kosmos”– is a line a school supplies featuring artwork to empower young Black minds. They have launched a crowdfunding campaign on Round1funding.com, and are seeking to raise $15,000 by June 30th, 2017. Kids of the Kosmos is a passion project led by Amethyst and Princeton Legree — sibling entrepreneurs from Orange County, California. With many educators and youth mentors in their family, education and youth advancement has always been important to them. They believe that this project will bring powerful life changes to Black children by sharing models of excellence who look like them. Their fundraising goal will enable them to mass produce their products by the start of back to school season this year. Their products currently include notebooks, journals, primary pencils, and subject folders. With help from donations, thousands of children will carry these inspiring images of Black achievement when they head back to class this fall. 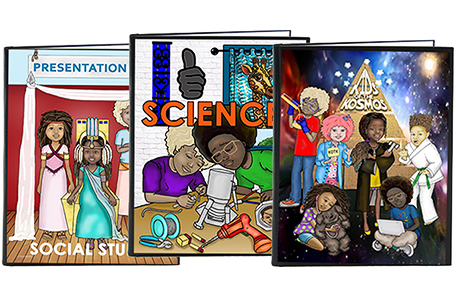 As “Kids of the Kosmos” grows, their vision includes a larger variety of educational products that share the history of Black people and their achievements. They will expand their product line to include coloring books, storybooks, and activity books. These products will portray the civilizations of Africa, Black folklore, and Black contributions to the modern world. Read more about Kids of the Kosmos and view their designs on their website (www.kidsofthekosmos.com), or visit their crowdfunding campaign on Round1funding.com (www.round1funding.com/kidsofthekosmos). Kids of the Kosmos is a brand owned and operated by See Right Enterprises, LLC, a Black family-owned company.